Single Speaker mode can be enabled or disabled regardless of the Talk Permission settings. The default setting is that anyone can transmit messages to the group at any time, even if someone else is transmitting. If single speaker is on you cannot transmit messages while another one is playing. If you try to transmit while a message is playing - you will receive a "no-go" error tone. Leader messages are always transmitted to all active group members. Org Members OnlyOff (Default): Any Orion user may join the group via invitation or group link. On: Only org members may join the group. When a group leader or org admin toggles this setting from Off to On, any group members outside the org are removed from the group. This setting only affects invitations sent within the Orion app, and does not affect the group share link. Access to the group may be further modified by whether this is an org members-only group. Everyone (Default): Anyone may send group invitations. Leaders Only: Only Leaders may send group invitations. Note: organization admins and group leaders are always able to directly add organization members to a group on the Orion Command Center. 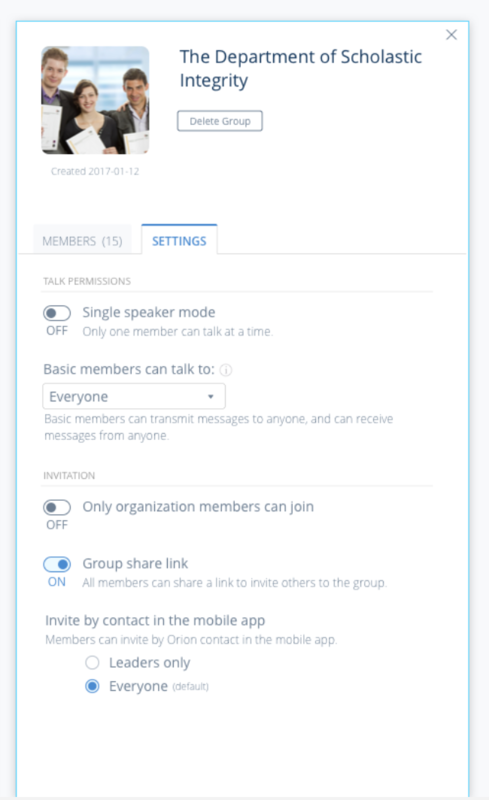 Group Share LinkOn (Default): Any group member can share a link to the group via text, email, etc. to any Orion user. Group links expire after approximately one month. Off: Access to a group link to share is disabled.